Of course, this came out on the day when I didn't bring my laptop home (browsing on the underpowered netbook). I can't WAIT to stitch these out tomorrow! They're gorgeous! These designs are absolutely beautiful - my favorite new designs - thank you so much! I was looking at the design after downloading it and some of the little flowers are missing. Will this be corrected in the future? Nice design, but I wish it had all the flowers as there is a large blank space. Thanks for letting me say something and I love the designs, they are really nice. clv6992 - I am so sorry! I will look into this right away - can you tell me which format you downloaded and which design seems to be missing the flowers? Had to get rid of the kids....the cat was allergic. I have discovered the problem! And, this was totally my fault, as Bonnie had included a new design with the stitchout - and she had added more flowers to the new one. And, please, feel free to send a support ticket (click on support on the blue toolbar) when you discover a problem. 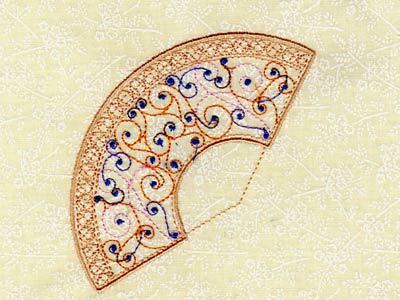 Pea, these are not FSL (Free Standing Lace) designs, they are considered filled designs. so they would be stitched on fabric. @Shastasmom. I found the sticking test as FSL and on fabric finally it is not FSL. But the question is, what are you all doing with it? Also because of the size. But the question is, what are you all doing with it? Pea, I don't either. They could be put on purses, totes, towels, etc. Because of the size, I would probably use more than one design on something. Hopefully, someone else will come around and let us know how they used them.